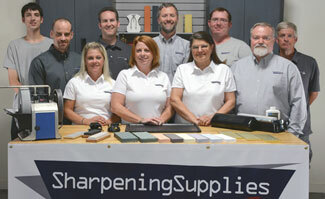 Get our FREE Sharpening Resource Guide with any $50 order. With the Model 440 you can sharpen 6 to 20 blades per hour depending on the condition of the blades. 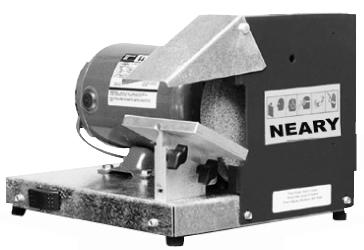 Sharpeners equipped to correctly sharpen rotary blades have big earning potential. The Model 440 is a fast, accurate, and efficient machine for sharpening. Features a 1/2 HP motor, a 8" x 1" grinding wheel, an adjustable blade guide, and a one year warranty. Made in the U.S.A. Thanks John, I am so glad to be working with people who know their products and how to use them. You have a very informative and well laid out website and I learned a lot. It was a rainy Sunday and I watched every video and read through each article. The information you provided was very helpful in teaching technique and helping me decide what to buy. Also your products are so well thought out, that no matter what stone you prefer (oil, water or diamond), there is a nice package available for a beginner. All of the products you put together each had their own advantages and believe me, each one spent some time in the shopping cart until I made my final decision.